Waterways flowing into the Great Lakes are hindered more by road crossings than dams, researchers at the University of Wisconsin find. Many migrating fish, they say, can’t jump over pipes or pass through culverts that make up the road crossings to reach native spawning grounds. The study’s findings that road crossings could have a more detrimental effect than dams on streamflow and habitat are significant because many planners overlook the role road crossings play when beginning restoration projects. For data on America’s half of the basin, researchers consulted the U.S. Geological Survey’s stock of stream data. They also reached out to experts at the University of Michigan for data on the Canadian side of the border. 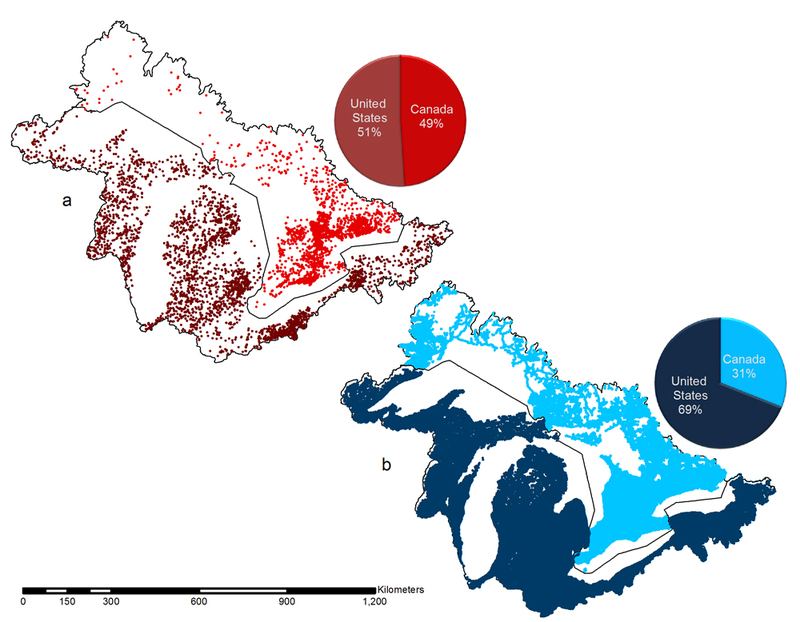 With both sides of the border already mapped, the Wisconsin team was able to filter out data that wasn’t needed for the study. From there, the University of Wisconsin team found that there are 38 times as many road crossings as there are dams in the Great Lakes Basin. There are more than 7,000 dams compared to more than 268,000 road crossings. So what can be done to remedy the effects road crossings have on streamflow in the basin? Januchowski-Hartley says changes can be made to how culverts are placed in land. Different kinds of culvert pipes can be used. Cement culverts give an easier flow than metal ones, which create waterfalls and drops that hinder fish. Potential barrier distribution in the US and Canada. Dams are in red (a) and the road crossings are in blue (b). Field observations from nature groups, watershed organizations and the Wisconsin Department of Natural Resources also added value to the investigation. Many of the smaller dams and streams had sparse data on record, Januchowski-Hartley said, and much of the researchers’ understanding was shaped by field data collected by those groups. There are differences between streams and rivers in the Great Lakes Basin, such as the presence of private dams, scarcity of specific data or the urban or rural settings in which they reside. The differences are so broad that no one approach can work for all.